Every company has certain rules and regulations when it comes to submitting resignation and one important rule is serving the notice period. If an employee of your company has resigned from his job without completing the notice period then before taking any further action against him, you must first write a formal letter to employee for leaving without notice. 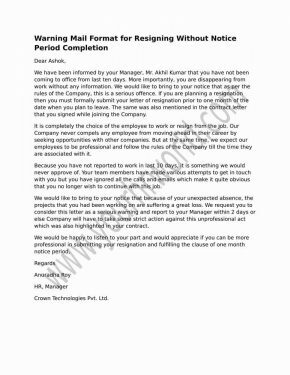 Using notice period letter template, you can comfortably draft warning letter for not completing a one month notice period to employee. To make this task easier for you, we have come up with letter format without notice period. Use this one month notice period letter format to frame a customized warning letter with essential details. We have been informed by your Manager, Mr. Akhil Kumar that you have not been coming to office from last ten days. More importantly, you are disappearing from work without any information. We would like to bring to your notice that as per the rules of the Company, this is a serious offence. If you are planning a resignation then you must formally submit your letter of resignation prior to one month of the date when you plan to leave. The same was also mentioned in the contract letter that you signed while joining the Company. It is completely the choice of the employee to work or resign from the job. Our Company never compels any employee from moving ahead in their career by seeking opportunities with other companies. But at the same time, we expect our employees to be professional and follow the rules of the Company till the time they are associated with it. Because you have not reported to work in last 10 days, it is something we would never approve of. Your team members have made various attempts to get in touch with you but you have ignored all the calls and emails which make it quite obvious that you no longer wish to continue with this job. We would like to bring to your notice that because of your unexpected absence, the projects that you had been working on are suffering a great loss. We request you to consider this letter as a serious warning and report to your Manager within 2 days or else Company will have to take some strict action against this unprofessional act which was also highlighted in your contract. if i am not confirmed employee of company. than i have to be serve notice period..???? ?